I don't know what this kuih is called and looking at the main ingredients which are only Three(3), thought it will be fun to call it so. I love this sitcom - Three's A Company and it has never failed to lift my spirit. I am still in contact with my classmates, who went to school with me from the day we started until we left school and they are my dearest friends. Nancy, who is still staying in Temiang, and when we chatted lately, the both of us were reminicsing and i wanted to know if that handsome Philippino boy who used to sell kuihs, is still around. 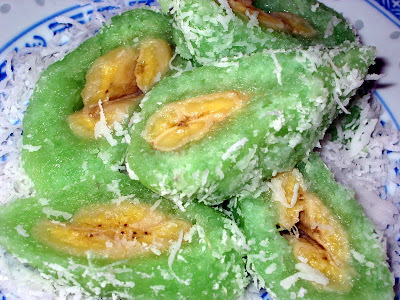 This banana, tapioca kuih was one of the many kuihs which he used to sell and i made it although i did not have the proper banana - pisang tanduk(horns). 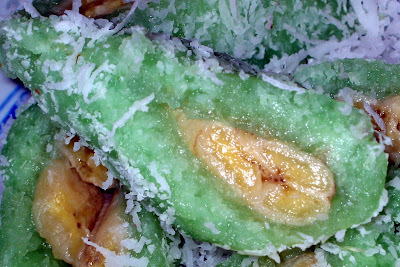 Steam grated coconut with salt for 5 - 8 minutes and leave aside for coating. 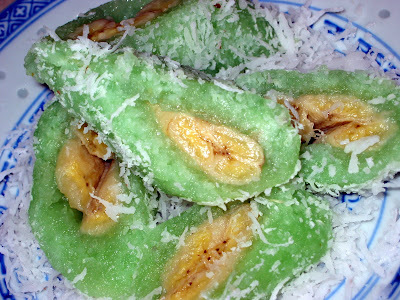 Put water, pandan paste, sugar, tapioca starch and drained cassava in a microwave-safe bowl and stir well to combine. Microwave on high one minute at a time, stirring after every one minute. Cook until mixture has thickened and almost cooked. Spoon enough cassava onto a greased cling wrap and flatten it to the length and width of the banana. Wrap banana totally with cassava and wrapped tightly. Repeat with the rest of cassava and banana. When done, steam the parcels for 10 - 15 minutes to complete cooking the cassava. Leave to cool, then remove the cling wrap and drop cassava onto steamed coconut.